At Oasis Day Spa, we offer skin care services that transform your skin naturally and give you the best results. Our approach is holistic, cutting-edge and suitable for all skin types and conditions. Each person's skin type is unique. We analyze your skin type and customize the treatment to address your skincare needs. Microdermabrasion is a cosmetic treatment that holds appeal for those of all ages and skin types. The benefits of microdermabrasion are appreciated most by people who want to refresh the appearance of their skin without resorting to more time-intensive and invasive procedures, such as deep chemical peels or laser treatment. The procedure simply remove the surface layer of dead skin cells through gentle exfoliation. The skin is not wounded or abraded past the epidermis. It is appropriate for cosmetic problems associated with aging skin, such as sun damage, age spots and other types of discoloration and fine lines that occur early in the aging process. The benefits of oxygen treatment are it cleanses the skin, peels dead skin cells, anti-oxident, anti-inflammatory, softens skin, smoothes skin and has soothing effect. 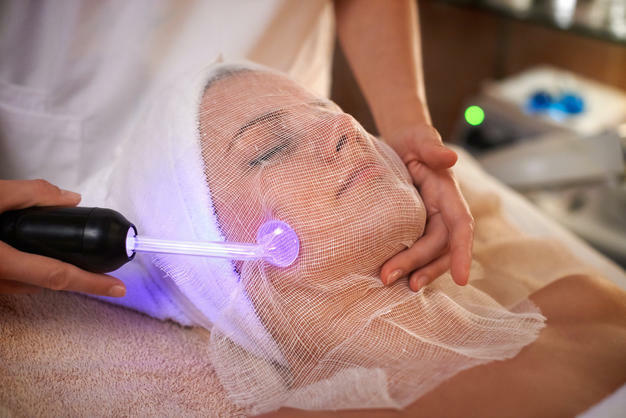 High frequency treatments are used to stimulate, sanitize and heal the skin. Used for years, this type of treatment is designed to provide high frequency currents that generate warmth in the skin and stimulate nerve endings, in turn increasing blood circulation, nourishing the skin and improving product penetration within the skin. By increasing skin metabolism, high frequency ozone facials encourage healthy cell function and promote skin healing. Direct high frequency offers the results of treating dry and dehydrated skin by increasing the activity in the sebaceous and soporiferous glands and causing a skin warming effect. Direct high frequency ozone provides benefits for those with blemish prone and acneic type skin by killing bacteria and eliminating oils.